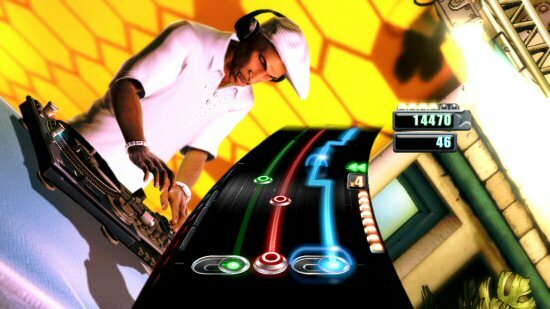 DJ Hero is the latest title in the ever-expanding rhythm action genre. With Activision’s own development studio, FreeStyle Games, behind the decks the Guitar Hero template is there to be built upon with a brand new peripheral that introduces a new style of gameplay. Though DJ Hero is said to be an extension of the Guitar Hero brand, and indeed does allow you to plug in a compatible guitar and jam away to a selection of tracks, it trades in the conventional instruments for the main star of the party, the turntable. As the turntabalist you’re tasked with scratching, cross-fading and sampling your way through 94 unique, never before heard D.J. mixes that blend the likes of Queen’s "Another One Bites the Dust" with Beastie Boy’s "Brass Monkey" and Bell Biv DeVoe’s “Poison” with Cameo’s “Word Up!". The comprehensive list of mixes, conjured up by internationally known DJs, such as Daft Punk and DJ Shadow, covers a variety of artists and spans a diverse range of genres ranging from soul to techno and pop to hip hop. DJ Hero comes boxed with a wireless turntable that features a mixing deck on the left hand-side, sporting an effects dial, crossfader slider, Euphoria button and a panel that hides the standard buttons that you’d find on a conventional controller, while the right hand side hosts a 360 degree rotatable turntable (platter) with three coloured stream buttons. In the box, you also get the wireless USB receiver and, of course, the game. The gameplay template is similar to the Guitar Hero franchise. Three lanes stream down the screen and correspond to the three coloured buttons on your turntable. Quite simply, you need to press these buttons, or hold them down and move the platter like you’re scratching a record, in time to the prompts on screen. There's also the chance to freestyle and also rewind tracks if you do well by rotating the platter full circle. The mixing deck adds a new twist to the genre and makes turntabling more difficult and challenging. The crossfader is used to move in between the two records that you’re attempting to mix together, whereas the effects button can be used to change the sound of the music,by muting the bass or adding more treble. You can also use it switch in between various effects, such as the sound of an airhorn. You can create your own custom playlists so you can just jump into your favourite tracks and play them in order, or you can play the main game mode where, similar to Guitar Hero, you'll play through various venues and increasingly difficult to master tracks, earning points and unlocking more venues, tracks and items to customise your superstar DJ. For those seeking further replay value, there's a host of downloadable content coming our way, plus competitive and cooperative multiplayer modes which are playable locally or remotely.